Should you transfer Pokemon from the 3DS Pokemon Virtual Consoles of Pokemon Red, Pokemon Blue, Pokemon Green, Pokemon Yellow, Pokemon Gold and Pokemon Silver, you can unlock a specific number of features within the game. The first unlockable feature is that of the Apricorn Balls found back in Pokemon Gold & Silver. In order to unlock and receive these special type of Poke Balls, all you must do is show the man in the Heahea City GameFreak Building a transferred Pokemon from the Virtual Consoles of either Pokemon Gold or Pokemon Silver when he asks you if you prefer the color Gold or Silver. 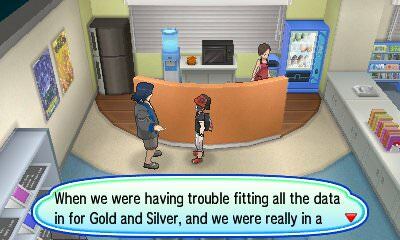 Another unlockable feature is that of the history of GameFreak itself. If you show any transferred Pokemon from any of the Virtual Consoles to Morimoto in the Heahea City GameFreak Building, he will give you specific history of GameFreak depending on the game the Pokemon you show him originated from. Below is all the history Morimoto will share with you. You know Diglett, right? It’s actually basically just a character that I had made up when I was a little kid. I even drew up a flip-book featuring it then! You know Mew, right? I made it. Everything about it. The pixel art, its cry, its Pokédex entry, everything. I just barely finished in time, too! It was right at the very end of the game’s development!